Remember that survey I gave out a few weeks ago? Let’s begin today with a little true or false pop quiz that is. . . similar. True or false: Jesus Christ went to the cross to destroy death and to give you the gift of eternal life. “True,” you say. True or false: Because of what Jesus did for you on the cross, and rising again, your sins are forgiven, you are covered in the righteousness of Christ, you are declared holy and sinless before the throne of God. “True,” you say. True or false: On the day of resurrection you will experience never-ending joy and peace as you stand face-to-face with your Lord and Savior Jesus Christ. “True,” you say. So then why does criticism bother us so much? Why do we sometimes worry about the future? Why do we worry about money sometimes? Why—if we know all that—are we so often dissatisfied and discontent? You see, you just scored 100 percent on the pop quiz—you made an A. Yet we seem to be failing when it comes to actually living out the Christian life. Folks, I don’t know about you, but it really doesn’t take all that much for me not to rejoice in the Lord. For example, I do not rejoice in the Lord when I have to pay my income taxes, which for me is four times a year. I do not rejoice in the Lord when the guy at the fast food drive-through forgets my fries, or even worse, forgets I didn’t want mayonnaise on my burger. I do not rejoice when my computer gets a virus and the hard drive has to be wiped and all my stuff reloaded. I do not rejoice when my cell phone dies four hours after taking it off the charger. I do not rejoice in the Lord when I wake up in a panic because I’ve forgotten to write, prepare, or do something here. These are times when I often do not rejoice in the Lord! 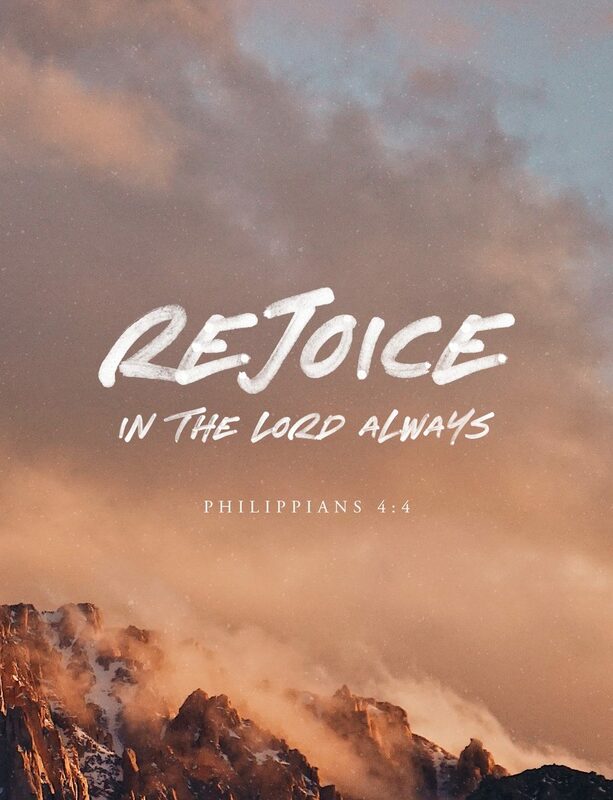 (Happy versus Joy) But Paul is telling us to rejoice in the Lord always. Paul was able to rejoice in the Lord despite being repeatedly beaten and tortured and being put on trial. Why? Our text for today from Philippians 3 gives us a clue. Do you see what gave Paul strength, what gave Paul hope, even in the most hopeless of situations? He considered everything a loss compared to the surpassing greatness of knowing Christ Jesus his Lord. He considered everything rubbish (in the Greek, literally filth) in order that he might gain Christ and be found in Him. In other words, Paul was given strength, courage, hope, and joy, all because he had faith in Jesus, he knew he was saved by Jesus. As he says here, the unshakable goal of his life was to get, by the grace of God, the resurrection from the dead. Why? Because Paul knew in the day of resurrection he would be with his Lord and Savior Jesus Christ forever. You see, Paul knew that the prize was certain. Paul knew that the prize would one day be his. That is what gave him the confidence to keep straining forward—that is what gave him the confidence to keep pressing on—no matter what. You see, What We Know Our Future is Going to Be Can Actually Change Our Present. Let me give you an illustration: There were two men who were both going to be working the same job. It was a terrible, awful job that nobody wanted to do. Eighty hours a week. Backbreaking, disgusting, menial work and they wouldn’t get paid until the end of the year. One of the men knew that at the end of the year he was going to be paid $15,000; the other knew he was going to be paid $15 million. Now, how do you think knowing that might affect the way they viewed their work? The one who knew he was going to be paid only $15,000 would be bitter and angry and grumpy. The one who knew he was going to be paid $15 million could be happy and joyful and would come to work every day whistling a happy tune! You see, when you know what your future is going to be, this actually changes you in the present. My friends, Jesus Christ went to the cross and rose again to destroy death and to give you the gift of eternal life. Because of what Jesus did for you on the cross, your sins are forgiven. Because Jesus Christ rose from the dead, you can be certain that you, too, will rise. And on that day of resurrection, you will experience never-ending joy and peace as you stand face-to-face with your Lord and Savior Jesus. That is what your future will be! That is the prize you’ve already won!